This year’s Kyoto Takigi (Fire-lit) Noh performance, at the Heian-jingu Shrine, Kyoto 1, 2 June 2014, will commemorate 680th anniversary of the birth of Kan’ami and the 650th anniversary of the birth of his son, Zeami. 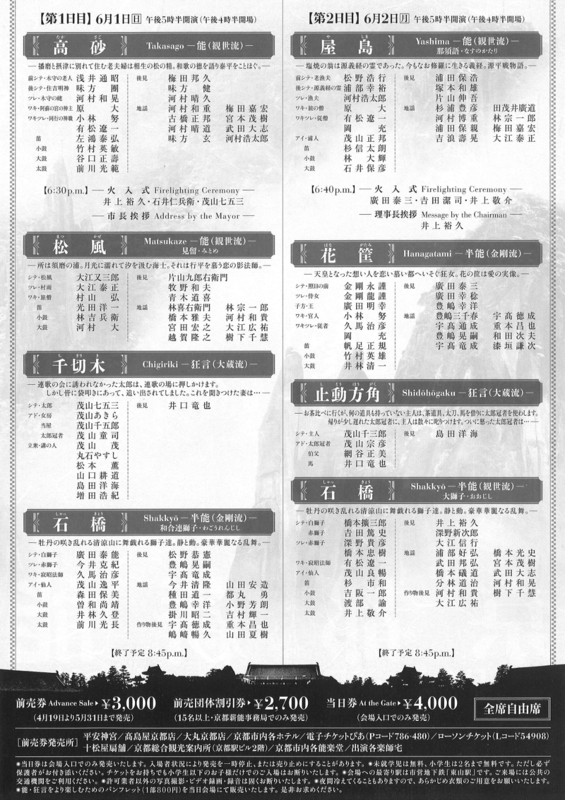 The programme features various classics, such as Matsukaze and Yashima, but its highlight is the double performance of Shakkyō as ending play for both days. The first day it will be performed by masters of the Kongō School, while the second day it will be performed by masters of the Kanze School. It is a great chance to appreciate the differences in the kogaki, or variations of the same play that are part of the Kongō and Kanze canon. 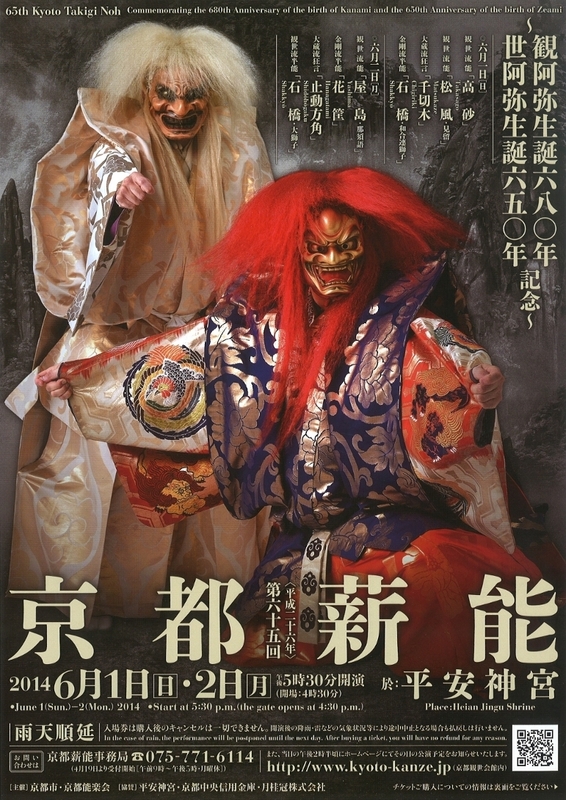 Kongō will stage the sago renjishi variation, with one white lion and one red lion, while Kanze will stage the ōjishi variation, with one white lion and three red lions. White and red are celebratory colours in Japan, which makes Shakkyō a suitable choice for the commemoration of the birth of the ‘fathers of Noh’, Kan’ami and Zeami. June 1 – Noh: Takasago (Kanze); Noh: Matsukaze (Kanze); Kyogen: Chigiriki (Okura); Noh: Shakkyō (Kongō). June 2 – Noh: Yashima (Kanze); Han-Noh (half Noh) Hanagatami (Kongō); Kyogen: Shidōhōgaku (Okura); Noh: Shakkyō (Kanze). Performances start at 17:30 and finish at 20:45. Gates will open at 16:00. Seats are not reserved so I suggest you to come early, and bring something to cover your head with (you might need to queue in the sun). Advanced sale tickets: 3,000yen. At the door: 4,000yen. Groups (15+): 2,700yen.